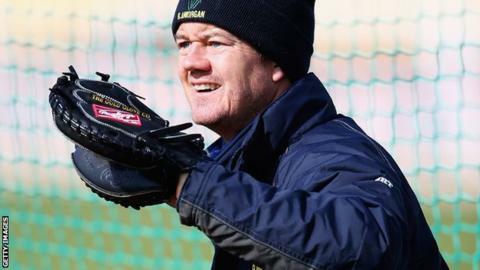 Glamorgan coach Toby Radford says Glamorgan's match against Kent is a crucial match for the county. Glamorgan have to beat Kent to maintain their slim hopes of qualifying for the quarter finals of the T20 Blast. The Welsh County were thrashed by eight wickets against Sussex in their last outing, and lie sixth in the South Group with two matches remaining. Head coach Toby Radford hopes his team can recapture their form against the group leaders. "We've played well away from Cardiff and we're looking forward to it because it's a huge game," he said. "We had a disappointing game against Sussex at Hove, didn't score enough, but we've done pretty well on the road. "Kent have been flying in this competition this year and we've been in and out. "Sometimes team get a bit of momentum going and clearly that's what Kent have done and they're full of confidence. "We've either won two or three in a row or lost two or three in a row but at our best we're capable of beating anyone." Glamorgan are one of seven teams who can claim one of other three remaining quarter final places. They have 12 points, but the lowest net run rate of any of the six teams on that mark. A victory would mean Glamorgan could secure a quarter final place with a win over Gloucestershire at home on Friday, July 24. A defeat at Tunbridge Wells would leave them relying on other results. Kent squad: D Bell-Drummond, J Denly, S Northeast (capt), S Billings, D Stevens, F Cowdrey, A Blake, M Coles, C Haggett, M Claydon, J Tredwell, M Hunn, S Dickinson, A Ball. Glamorgan squad: J Rudolph (capt), C Ingram, A Donald, B Wright, C Cooke, C Meschede, G Wagg, M Wallace, D Lloyd, A Salter, D Cosker, M Hogan.